Born in Cuba and raised in Puerto Rico, Gerardo "Gerry" Lopez fondly recalls the first movie he saw in the United States, in 1977: Star Wars. "Wow, the special effects and flying through space—it was great!" says Lopez (MBA 1984), summarizing his reaction as a 17-year-old student at George Washington University. "Now think of the magic of Avatar in 3D. In that interim period, between 1977 and 2010, the technological advances in moviemaking were unbelievable. But that was not at all matched by any change in the concession stands, the theater seats, the auditoriums themselves—okay, maybe there would be stadium seating, but that's about it. It's remarkable. And not in a good way." Lopez, it seems, is just getting warmed up. "Can you imagine driving the same car in 2010 that you drove in 1977, with the same features? There's almost nothing in the 2010 consumer economy at large that was the same as it was in 1977, and certainly not in the entertainment space." 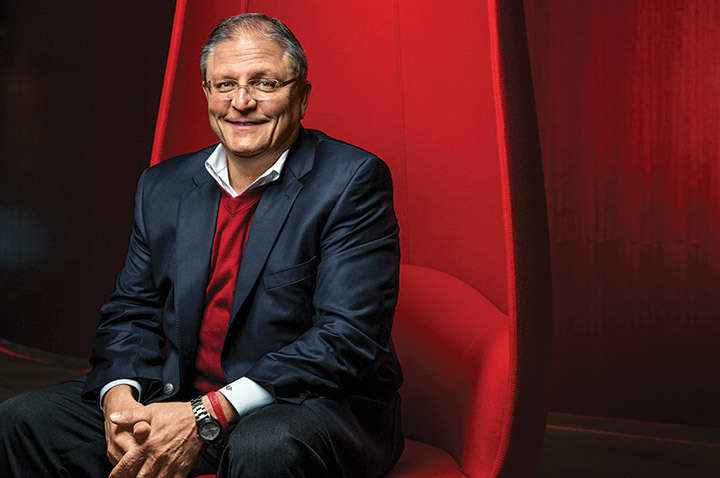 As CEO of AMC Theatres since March 2009, Lopez has been addressing that discrepancy with a passion and drive not usually seen in a business often considered a sleepy backwater. That sense of urgency is a necessity, too—by now, it's news to no one that moviegoers have many more entertainment options that don't involve getting in a car and driving to a theater. A weekly or monthly outing to the movies is no longer as prevalent. Stream a movie from Netflix on your gigantic flat-screen TV, settle onto a cozy couch in the comfort and privacy of your own home, and enjoy. And that's just the start, as the "anywhere, anytime" push to view movies and other content on mobile devices continues to grow. According to one Cisco report, smartphone video viewing will grow tenfold over the next five years. But Lopez still likes his chances. "Moviegoing is embedded in the American social fabric," he says during a conversation at AMC's Theatre Support Center (the company's corporate headquarters) in Leawood, a suburb of Kansas City, Missouri. "We provide the opportunity to escape the daily routine. It's a social behavior that should endure beyond technological change—if we nurture it." Craig Ramsey, AMC's CFO, has worked at the company for 20 years, with two earlier leaders. "Under Gerry, we've gone from a film-centric business to a customer-centric business. One of his guiding principles is, 'We have to remove obstacles for the consumer.'" Odd as it sounds, the customer has not been a historical focus for the movie theater industry. As Ramsey points out, the business got going in the 1930s and 1940s, when it was typical for one print of a movie to be licensed in a city. If you were lucky enough to get a blockbuster like Gone with the Wind, a theater owner simply had to screen the movie for people to line up around the block. Today, with movies showing at multiple times and locations, to say nothing of the dizzying array of entertainment options, the challenge is how to become the customer's destination of choice. For Lopez, that has meant deploying a multifaceted strategy with an underlying premise: Make the customer feel at home while providing a sense of escape. "My career has always been about consumer persuasion," says Lopez, who came to AMC after leadership stints at Starbucks, PepsiCo, Procter & Gamble, and other consumer-goods businesses. "Create or identify the need, and then fulfill that need in a big way." Lopez arrived at Starbucks in 2004 to lead its global consumer-products division and, over time, expanded his responsibilities to include subsidiary Seattle's Best Coffee and all food service outlets. "When Gerry was hired, it was the company's first deliberate action to view consumer packaged goods as an important growth platform for Starbucks," says Barry Beeninga, a 16-year veteran of the company who worked with Lopez as CFO of his division. "We had recently signed agreements with Dreyers for ice cream and PepsiCo for the bottled Frappuccino," recalls Beeninga, who is now retired. "It was a time of exploring where we could take the brand, and Gerry would always ask, 'Where does the consumer give us permission?' We could have slapped our name on almost anything. But that's not what Starbucks' brand is all about. It had to be the right fit. He helped us figure that out." Over their four-plus years of working together, Beeninga kept a notebook of Lopez's more memorable comments. For a Christmas gift one year, he personalized a set of golf balls with a Lopez mantra: We gotta go. "His point was that we were talking, talking, talking. Let's make a decision and go," says Beeninga. "But Gerry was also someone who really listened, instead of just waiting for his turn to talk. He would say, 'What does Barry think?' That was very empowering—it made me work that much harder to analyze whether or not a deal made financial sense." According to Beeninga, Lopez was also a clear and direct communicator when things were not going well. Another Lopez quote, in the context of prolonged sluggish results: "Okay, in those 18 months we could have had two babies." "Gerry had to take a company rooted in its history, in one kind of business, and develop a strategy and execution around migrating that experience from the traditional venue of our retail stores into new business areas and channels of distribution," says Starbucks COO Troy Alstead, who recalls Lopez as "not overly caught up in the hierarchy of leadership. He engaged with you regardless of your level in the company. That really mattered at a place like Starbucks." Lopez sees a direct connection between his focus at Starbucks and his work at AMC. "One of the first things I learned at Starbucks is that it is not in the coffee business, serving people—it's in the people business, serving coffee. It's about the human experience of coffee, which as a concept is very transferable from one business to another." 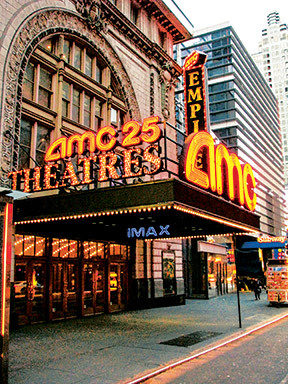 That focus on the customer experience has led to a significant shift in strategy as AMC theaters undergo renovation. "For years, every measure of success in our industry was driven by quantity," Lopez observes. "How many buildings, how many screens, how many seats? We turned that equation around and began to focus on quality." AMC's roots date back to 1920, when a trio of traveling performers known as the Dubinksy Brothers (Maurice, Edward, and Barney) bought the Regent Theater in downtown Kansas City. The brothers changed their name to Durwood, and in 1961, Stanley Durwood took over the business when his father died. A graduate of Harvard College, Durwood expanded the chain's reach and in 1963 introduced moviegoers to the first US "multiplex" by renovating a theater to include two screens; in 1988, the company opened North America's first "megaplex," the AMC Grand 24 in Dallas, Texas, and pioneered stadium seating in 1995. The second-largest American movie theater chain (behind Regal Entertainment Group and ahead of Cinemark Theatres), AMC has 345 theaters and nearly 5,000 screens across the United States, with about 20,000 employees hosting some 200 million moviegoers each year. (AMC has the largest market share in metropolitan markets such as New York, Chicago, Los Angeles, Dallas, and Detroit.) 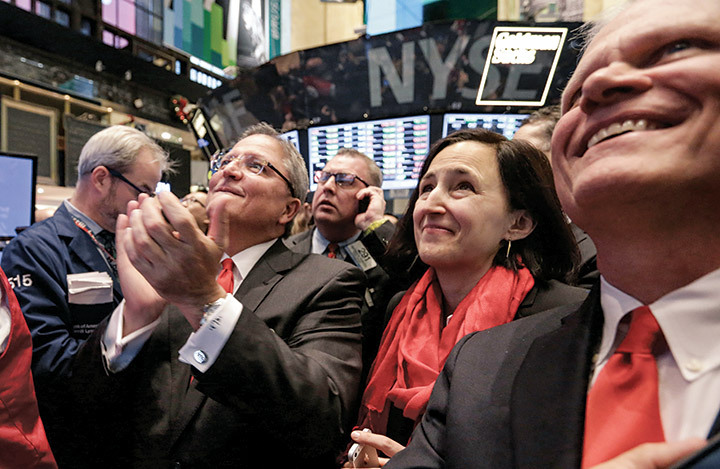 When Lopez became the company's fourth CEO, succeeding Peter Brown in 2009, the company had seen some rough years. "In the early 2000s, the industry had a brush with death," Lopez recalls. "The result was a very strict financial operating focus, which is understandable—if you come close to bankruptcy, oh, you will get religion. But over the course of the ensuing 10 years, that tight focus caused the industry to forget that customers matter." The articles that reported this news also wondered if AMC was a good investment, given the rise of online movie viewing and home entertainment. With the stock trading in the $22 to $25 range in April, however, Lopez is pleased. "We didn't want to quadruple the stock price on the first day," he says. "When that happens, it means the company left a lot of money on the table. We priced it at $18. The shares opened at $19.18 and change, and floated up to $20 in the first week or so. Perfect. It worked exactly as we thought it would. And any time that you can lay out a plan and execute it—that's a good day." Strangely enough, in AMC's reinvented theaters, one of the most dramatic embodiments of Lopez's quality-over-quantity strategy is a 1950s icon: an electric La-Z-Boy–style chair that reclines at the touch of a button. The recliners require more space, meaning fewer seats and less raw capacity. But early indications show that attendance at rehabbed theaters increased 80 percent, with ticket prices just slightly above those with regular seats. (Lopez says they continue to watch the supply-demand curve and dynamics specific to a market's geography to determine pricing.) A less visible change over the past five years has been a conversion from 35-millimeter to digital projection, a costly but necessary move that Lopez notes did not result in any noticeable bump in attendance. On a Wednesday night, at a renovated theater in Olathe, Kansas, $9.75 buys one of just 32 tickets available for a showing of The Monuments Men. 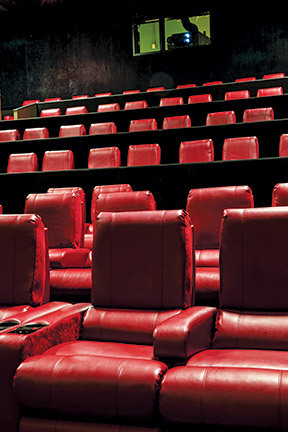 AMC Studio 30 is among 13 AMC venues offering a full, seat-side service menu, with items such as Thai shrimp, chicken Alfredo, and a waffle sundae as well as beer, wine, and cocktails. After reclining at the push of a button, a moviegoer can order a margarita ($8.99) and slice of strawberry-topped cheesecake ($6.99) from a server. In this "Cinema Suites" auditorium, one of three in the building, you must also be at least 21. Eight other "Fork and Screen" auditoriums at AMC Studio 30 offer the same full menu to guests 18 and over, as well as children accompanied by a parent or guardian. There's also an IMAX theater (AMC has more than any theater group in the world); the remaining 17 screens have standard seating. All visitors, however, can enjoy a convenience store–style concession experience, which allows guests to serve themselves before paying at the register; they can also visit the MacGuffins bar and lounge for a drink, or the café for a cappuccino. Improving the customer experience to such a degree involves more moving parts than turning on a popcorn machine and dispensing soda, which makes Lopez's habit of hanging around AMC theaters a necessity. "I love, love, standing in a corner with a Diet Coke in my hand," he says. "If it's a well-run theater, it's poetry in motion. And if it's poorly run, you can't hide." Observing who comes to the theater also has its a-ha! moments. At the opening night of Twilight: New Moon, Lopez happened to be visiting the AMC Village Crossing 18 in Skokie, Illinois. He watched as a caravan of minivans and SUVs disgorged carload after carload of teenagers. "I realized, 'Oh my God, that's our business and that's our most valuable asset . . . the fact that these parents were dropping off their daughters at our place, each with a $20 bill in their hand, God bless them. The trust they've placed in us to provide a clean, safe environment for their child—whatever we do, it's sacred, let's not screw that up." 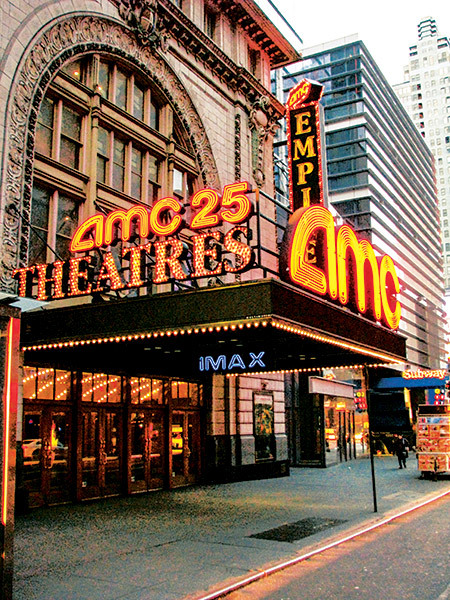 Despite AMC's focus on improving the customer experience, Lopez knows as well as anyone that his business is driven by a product—specifically, those must-see movies that get people out of the house and into the theaters. In Blockbusters: Hit-Making, Risk-Taking, and the Big Business of Entertainment, HBS professor Anita Elberse documents the powerful, long-term success of high-investment, high-reward entertainment products, including movies. "She's absolutely right," says Lopez. "Those big successes spin off cash like there's no tomorrow." While the much-ballyhooed advent of 3D movies ushered in by Avatar hasn't been quite the saving grace that Hollywood had hoped, Lopez has a more practical outlook as a veteran of the consumer packaged goods industry: "Any time you can take a chunk of your business and move it to a segment that commands a 32 percent premium, you're going to do that every time, all day long." Lopez maintains that a few of the two dozen or so movies that come out in 3D each year are essential to see in that format, such as the Oscar-winning Gravity. For others, consumers will choose a showing more by the time and place it's offered than by its format. As AMC's chief content and programming officer, Elizabeth Frank (MBA 1994) works closely with Lopez to determine the movies that AMC shows, in addition to negotiating terms with the studios. (Formerly at Time Warner, Frank has also sat on the other side of the table.) "Ours is a content-driven business, so we need to maximize moviegoing to Hollywood blockbusters and also source smaller movies that appeal to our diverse audiences throughout the year," says Frank, who cites Lopez's "incredible positive energy and vision" as the key reason for her family's relocation to Missouri four years ago. "In the past, we relied on the habitual aspect of moviegoing, with consumers doing all the work. Now we're using social media and our AMC Stubs loyalty program to engage with customers and make it easier as a planned activity." Another strategy involves targeted programming for specific demographic groups, such as the latest Bollywood or Spanish-language films. AMC also works with churches and other groups to arrange for private screenings of movies such as the recent Son of God; on Sunday mornings, some churches can even be found using a theater for their worship service. In 2011, AMC also co-launched its own film distribution business with the country's largest theater chain, Regal Entertainment Group. Led by CEO Tom Ortenberg, Open Road Films focuses on independent films such as Chef, starring Jon Favreau and Scarlett Johansson, which opened in May. It's all part of Lopez's strategy of driving straight to the heart of customer need, "not in a niche-y way, but rather a hundreds of thousands kind of way." How it all plays out remains to be seen. Like any good Hollywood action flick (the genre Lopez happens to prefer), the AMC story has a knock-him-down star at its center who gets up every time and keeps moving ahead. Remembering his former Starbucks colleague, Barry Beeninga says, "Gerry is a fighter. I remember him saying, 'Man, I don't walk away from a fight, I go toward it.'" "In the early 2000s, the industry had a brush with death. The result was a very strict financial operating focus. But that caused the industry to forget that customers matter."